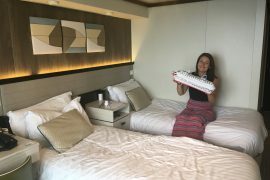 Hey guys, you may have seen that I recently posted a video where I gave you guys a tour of my inside cabin onboard the Independence of the seas. 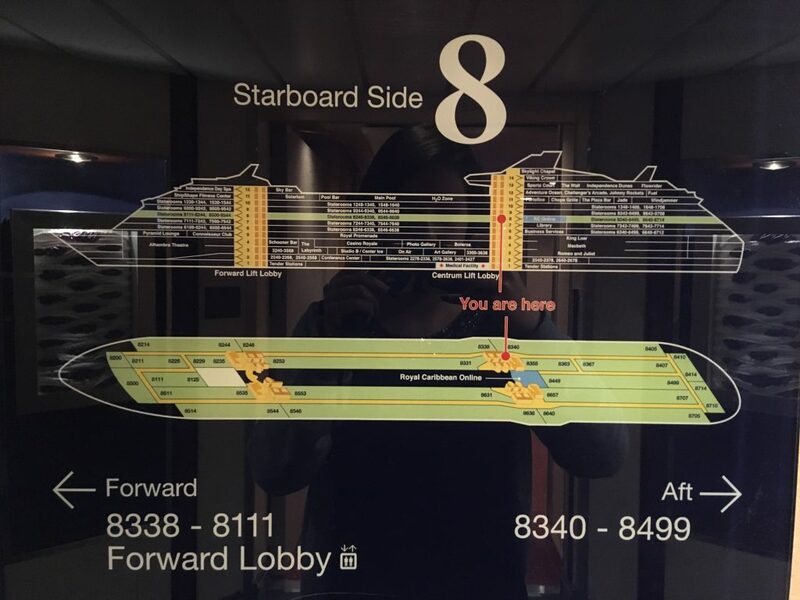 (Make sure you check that out here if you haven’t) Our cabin was 8405 and was RIGHT at the end of deck 8, we booked a guaranteed inside cabin and ended up with the lowest grade category on deck 8. Want to know what I thought of the cabin and see lots of photos? Keep reading. This is the view that you are greeted with when you enter the cabin. I feel as though it looks a little caravan-like but it was perfectly clean and comfortable. 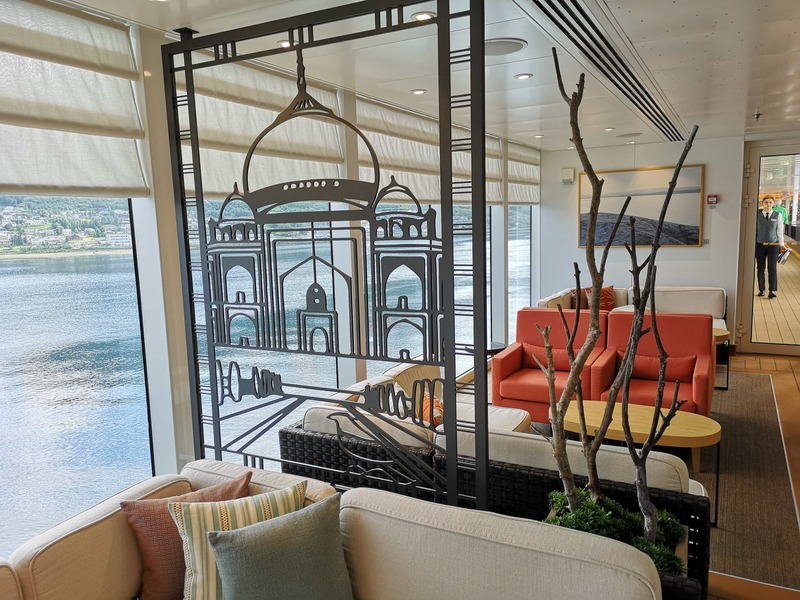 Many argue that the cabins are looking dated, I do agree that there is no ‘wow’ factor here but the cabins aren’t badly decorated in my opinion. Do you like my inflatable Independence of the seas standing by the mirror? I love it! 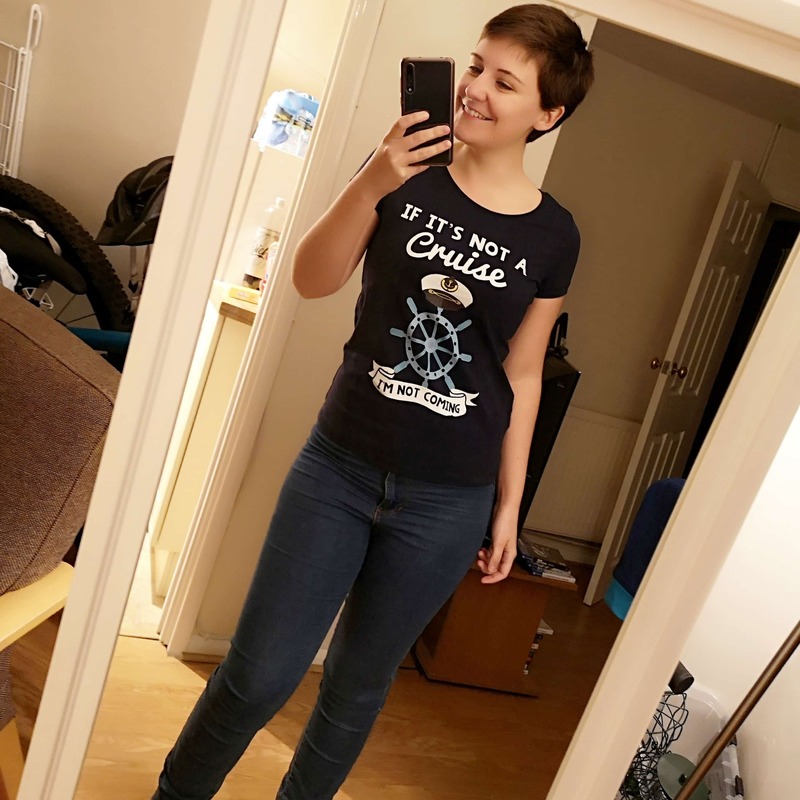 I bought it in the gift shop for $7. This is the view facing the door. As you can see it is a pretty standard inside cabin set up with a desk and chair. The cabin had a kettle! Woohoo. 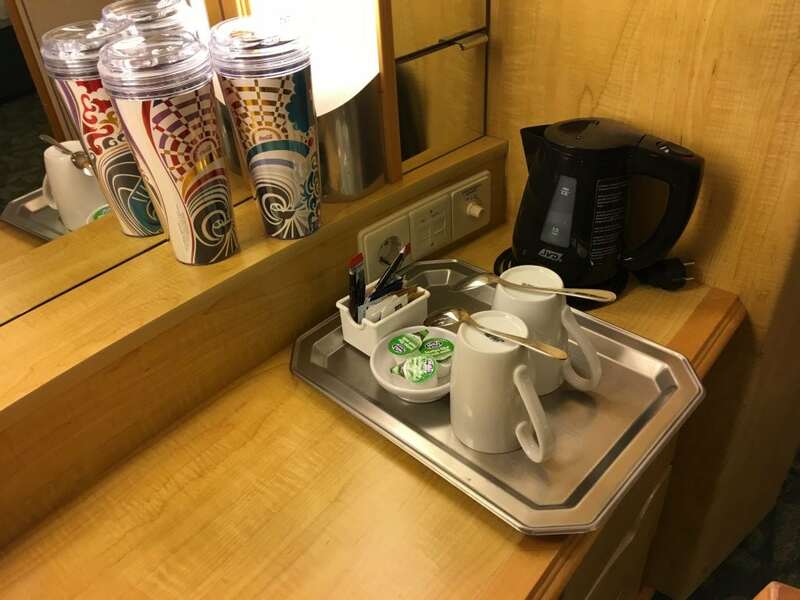 I believe this was because we were cruising the UK, I very much doubt they have kettles when cruising the Caribbean or Hawaii… We had the soda package, you can see our free soda cups there. There is one European plug and two US plugs in the cabin. I have never had a problem with needing more plugs although I know a lot of people do opt to bring an extension cord when they cruise. The wardrobe was big, much bigger than I have at home. There is a safe, some shelves for your stuff and a place to hang your clothes (with plenty of coat hangers!). There would also be enough room in here to put your suitcases but ours happily fit under the bed. 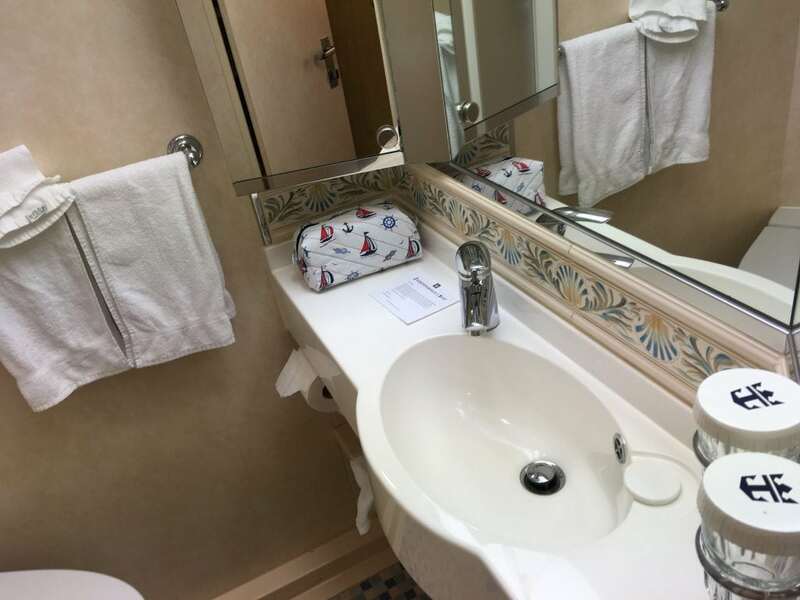 As you probably know, it is REALLY difficult to take a photo of a bathroom on a cruise ship. (This one is much easier to see in the video). 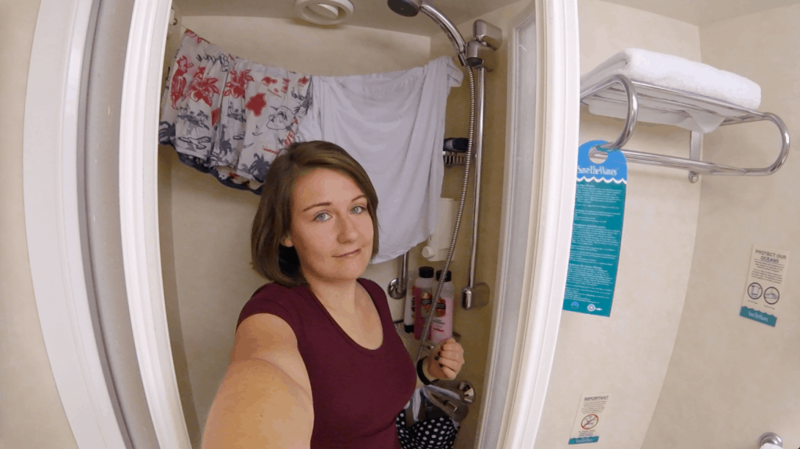 The bathroom was perfectly clean and nice, the shower was really good and I had a lot of room above my head. There is also some shampoo/body wash in the shower but I bought my own. It also had a little washing line where I dried my clothes after my first go on the FlowRider. 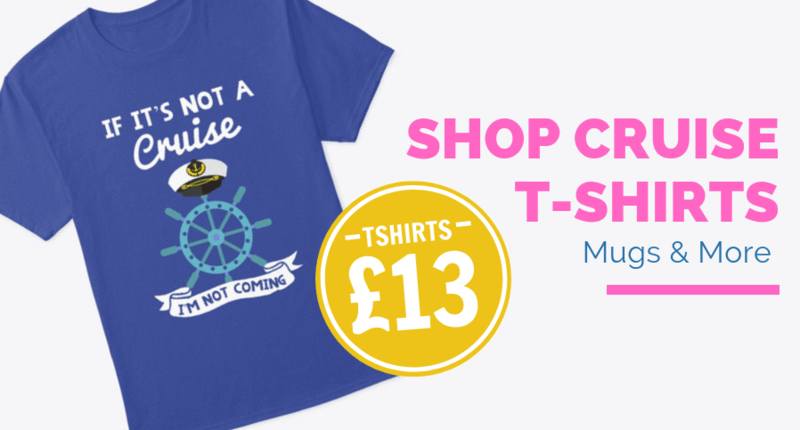 If you fancy checking out how I got on then click here. We were right at the back end of the ship. You can actually see our cabin, 8405, marked on the bottom diagram here. It was quite a walk to the back but we never had any problems with the location. Luckily the buffet was at the back so it was no trouble to head up for a snack. It may have been different if we were right at the front! 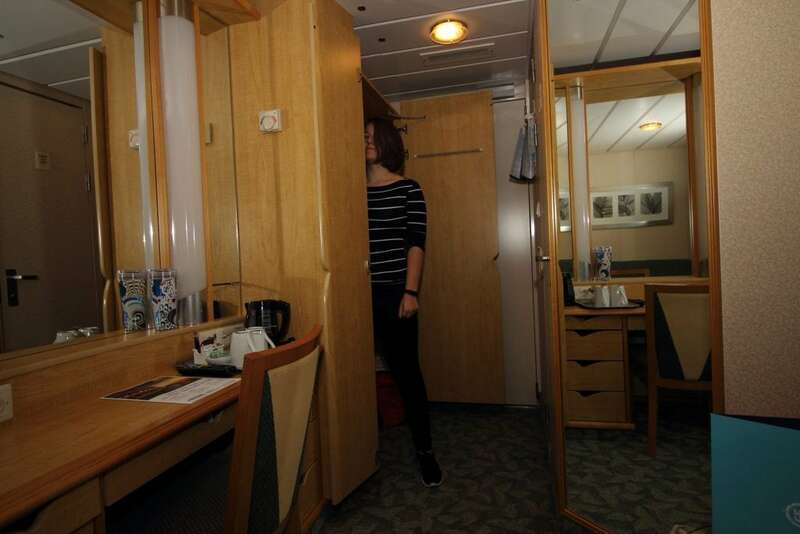 Our cabin was really quiet, we only had one ‘neighbour’ and never heard anything from them. 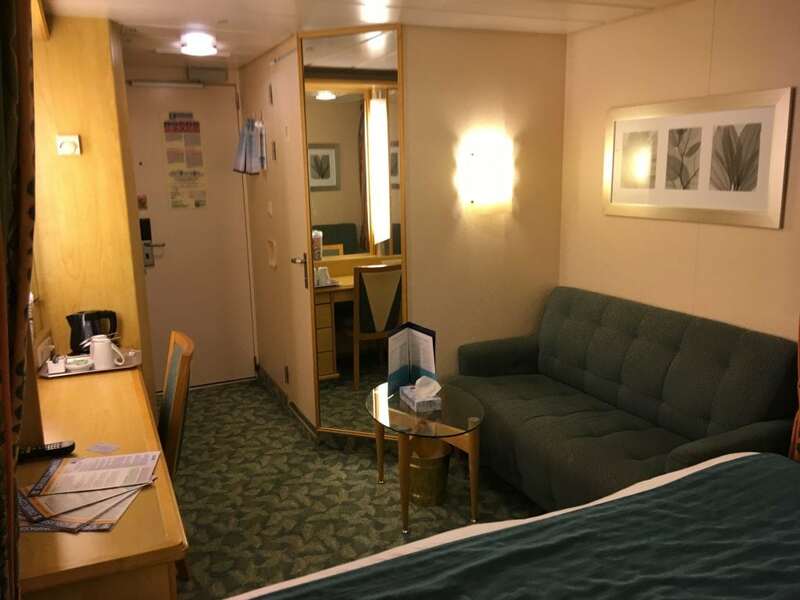 I believe the cabins next to us had balconies/windows as were on the ‘outside’ of the ship. I was actually pretty pleasantly surprised about the cabin. The location at the back wasn’t bad at all and although the decor in the cabin is a little dated it was perfectly clean and functional. 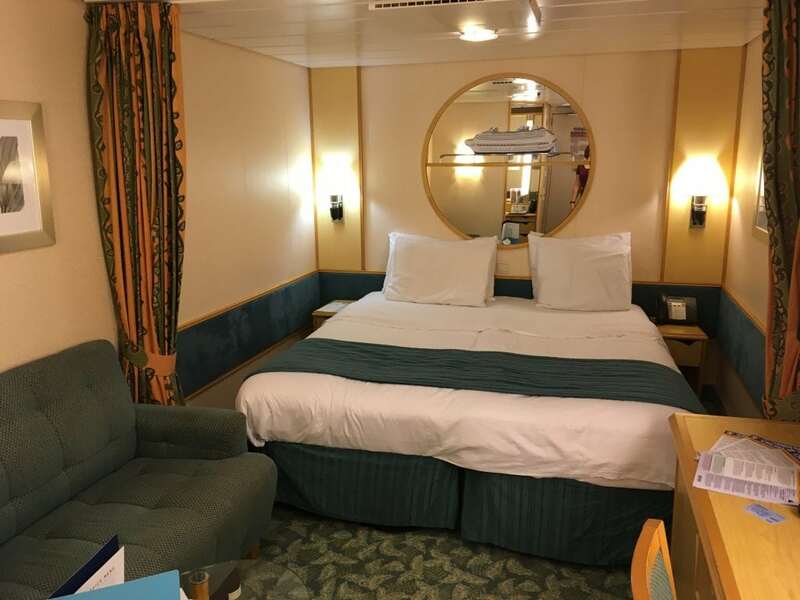 We had a really brilliant cruise and honestly didn’t have too much time to hang around our cabin, there was far too much to do onboard. 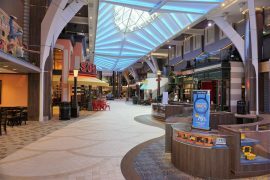 If you fancy reading the full review of the Independence of the seas click here: Independence of the seas ship review . Just incase you haven’t had enough of me yet… check out the video below! I had the opportunity to go on the Anthem of the Seas for a Pre launch promo cruise. We had a balcony room, but we were also shown an indoor room. I was very impressed with it as it had a massive 4k screen of the outside, (live video). Very impressive and I guess would give you the feeling you were not in the middle of the boat. 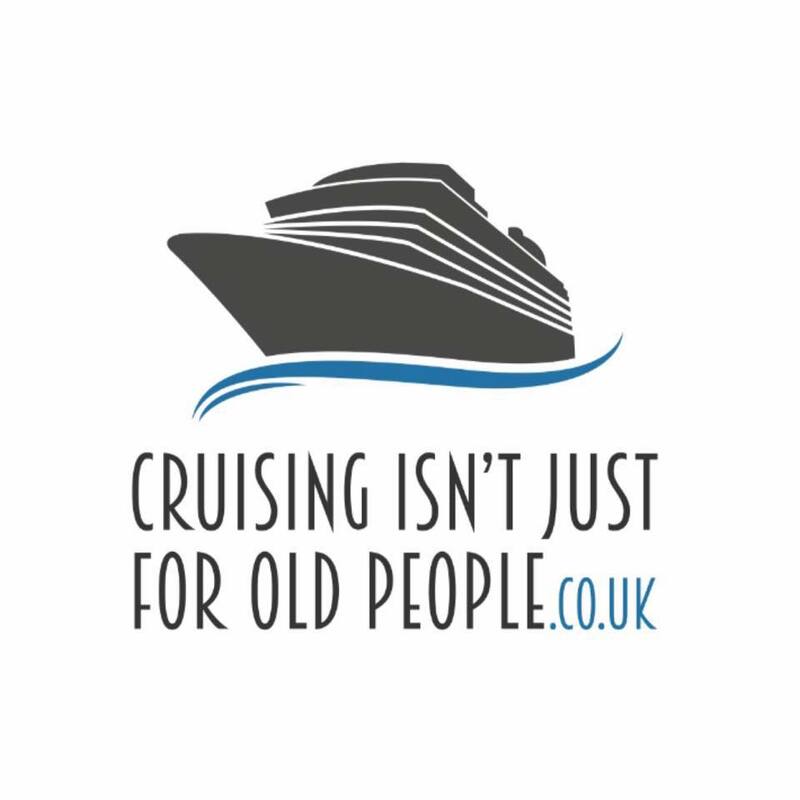 Did you find travel sickness was better in an inside room compared to an outside one? I always prefer to see where I am but I have heard being in the centre of the ship is easier. That sounds amazing!!! I’d love to try one of those cabins. I’ve only been in an outside cabin once so can’t really say I notice a difference. A balcony is definitely much better for sea sickness because being able to sit out in the fresh air helps a LOT.